FIRST TEST SITE & ISSUE, TEST EDITIONS (Saturday Feb 14 , 2004 through July 3, 2006) Intergalactic Femme Fatales, the Amazins, counter-strike the universal nemesis duo, known to the earthbound as The Genesis Goons, which have been making life tenuous, uncomfortable and jittery. The anti-heroes live out their form of life in a parallel universe which corresponds to ours in many ways, eerily similar world leaders and hidden forces intent on making their beliefs, of One Religion, One World, come true, the One World Goons. That's how they're known in their land. 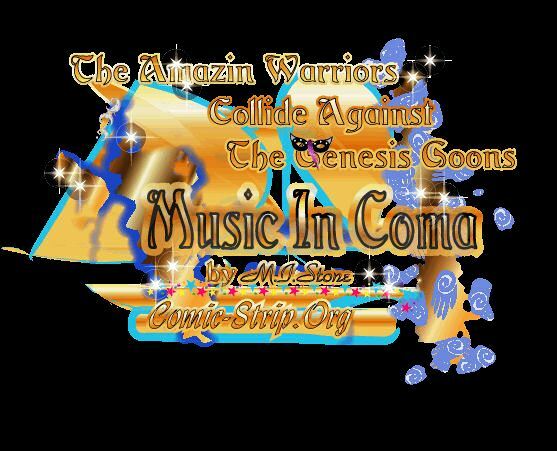 In this edition of The Amazins, The Genesis Goons Decree is Music in Coma! During this Parallel Moment of Terror, the Space Law Atty. seeks the release of false flag operation fighters, complicating the whole story. The Amazin Warriors are propelled in the battle of their delicate, feminine lives: The Mission: Rid the Earth of the Genesis Goons, at any cost! In this edition of The Amazins, The Genesis Goons Decree is Music in Coma! "Metalurges cry out at their escape" --Sludge: Kriminy! To compete is sound for Metalurges dwelling, but these Goons want stake on our mind-set, heavy. Their betrayal will be their ultimate humiliation - - and their last!